And for an architect like Franklin Azzi, with who we are traveling a Parisian realization while walking on the Berges de Seine, left bank, between the bridge of Alma and the port of Solferino … What does an intervention on object – worship furniture mean? “This object is resolutely simple, without fantasy, it comes from a work less easy than it looks on the “normality”. It was not a question of making a big gesture to divert it, so I developed a more scientific and creative approach, with numerical simulations, to achieve the desired result. I assumed that cork was a raw material, considered “noble”. To respond to this original object, I also adopted a crude response: courtyard elastics. And finally, what emerges is that the placement of the frames of elastic, their variable tensions and their equally variable tints give the illusion of a noble matter and a rather sophisticated ornamental motif. The circular bases of the object allowed these crossings of frames, inspired by the spirograph but also the wall paintings of Sol Lewitt. I hope that Jasper Morrison does not blame me for having covered it with latex, it must be known that it is reversible! “. 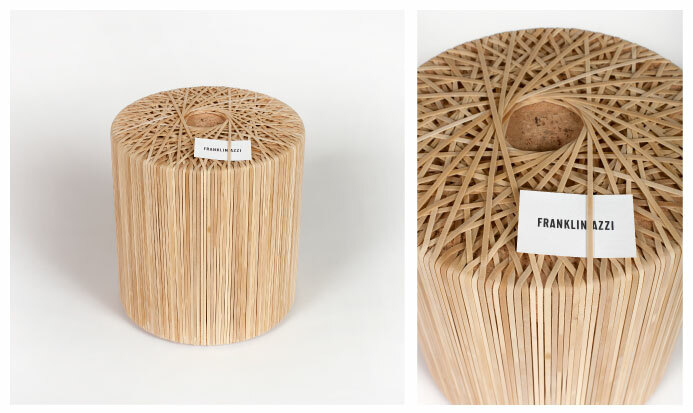 Each Cork, decorticated, shows how designers cudge to give birth to a meaning. From meaning added to meaning, avoiding the contradiction. A story of respect. A return to “the Source”.